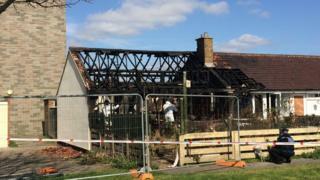 A woman who died in a fire which ripped through a bungalow in Gosport has been named. Firefighters took 52-year-old Samantha Redford out of her home on Nyria Way off Willis Road after the fire broke out at midday on Monday. Despite attempts to resuscitate her, Ms Redford, who it is understood used a wheelchair, was pronounced dead at the scene. The fire service said a dog also died in the fire. Twenty-six firefighters tackled the blaze which also spread to a neighbouring property. Hampshire Fire and Rescue are continuing to investigate the cause of the fire, along with the police.